The Thank You Page is the forgotten child of online marketing. As the place to send prospects once they’ve filled out your registration form, most thank you pages host the content on offer, a Google conversion code, a link to the corporate Website, and little else. But is that a missed opportunity? Can thank you pages be designed to work harder, to elicit more information from prospects and edge them further along the sales cycle? The first thing that merits comment is that a link to the content is being emailed to me, not simply presented on the thank you page. There are two key advantages to the fulfillment-by-email approach: one, it forces prospects to provide valid email addresses, and two, the email will reside in the prospect’s inbox to be forwarded to colleagues and/or stored for future reference, increasing both the reach and shelf-life of the offer. 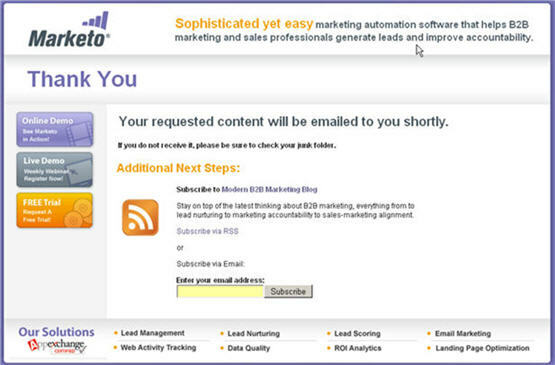 Secondly, Marketo uses the thank you page to invite me to subscribe to their B2B Marketing Blog, either by RSS or email. (Note also the way that Marketo “sells” the blog by describing the type of content to be expected, and the benefit of being a subscriber.) I’m not privy to the conversion rate from this thank you page tactic [note to Marketo – if you’re reading this, feel free to ‘fess up in the comments] but my guess is that it’s higher than the standard registration form checkbox. What a brilliant way to drive additional opt-in subscriptions. Let’s take this a step further. Conceivably (and for all I know, Marketo may do this already), you could serve up different thank you pages depending upon past prospect behavior. Invite the person to subscribe if he doesn’t already, but if he’s already a subscriber, invite him to a Webinar instead. And so on. This entry was posted in B2B Marketing, Demand Generation, Landing Pages and tagged Landing Pages, marketo, Marketo consultant, Marketo partner, Marketo Thank You Page, online marketing, thank you pages, web design on September 1, 2009 by Howard Sewell. Thanks for the kudos, Howard. Using the technique you describe, we’ve grown the subscriber list to our blog to over 4,000 people. We also recently used the technique of using the Thank You page to promote a second offer to generate more than 1,200 registrants for a webinar. This stuff works!